These are the names of David’s mighty men. . . . Among the Thirty were . . . Eliam son of Ahithophel the Gilonite . . . and Uriah the Hittite. There were thirty-seven in all. Ahithophel was the king’s counselor. Hushai the Arkite was the king’s friend. Darkness curtained the sky, hiding the stars, sheltering Bath- sheba in the inner courtyard of her home. She clutched the soft linen towel to her chest, shivering, while Uriah stood with his back to her, a sentry guarding her privacy. “Of course you must do this, but hurry, dear wife.” His mischievous tone heated her blood. Suddenly the chilly spring breeze seeping from her bare feet to the rest of her robe- draped body didn’t seem quite so cold. He turned to face her, his dark eyes pools of interest. She had never suggested such a thing before. Tirzah always helped her do this. It was a woman’s place, a woman’s ritual. Would his strict adherence to the law of Moses let him help her? Did she want him to? enough to know he was thinking through every purification law and tradition to determine whether such a thing was proper before Adonai. “We would defeat the purpose, Bathsheba,” he said at last. “Though if Tirzah were not available to help . . . I am your husband, after all.” Gentleness filled his expression, his eyes revealing how much he longed to do as she asked. “It is a sacred moment.” She looked into his face as he took a step closer. “To remind a woman she is set apart unto God, and for her husband alone.” She placed a hand on his arm, seeing him warm to the thought. “The law of Moses—it would allow for such a thing?” He rubbed a hand over his beard, the thought clearly troubling. He worked so hard to obey the law . . . If only he could relax and not take every jot, every little word, so strictly. But even after three years of marriage, she trod carefully in matters of the law lest she be party to his guilt. Guilt that was not worth the price of carelessness. “I don’t know,” she said at last, stroking his cheek with her hand. “Until we do, Tirzah will help me. I will hurry.” She smiled at the relief in his eyes and moved quickly to the bronze basin he had purchased for her own private use. She set the towel on the stone bench beside it, and slipped the robe from her shoulders, listening to his sigh. “I will ask Jozadak in the morning.” The lame Levite tutor Uriah paid to teach him the law would spend many hours seeking an answer to Uriah’s question. She glanced at him, his back now turned to her, the well- muscled body evident beneath a tan linen tunic. He was an intelligent, handsome man, and she marveled at his constant questions, his determination to learn the ways of her people. “Are you ready, mistress?” Tirzah interrupted her musings, pulling her thoughts back to their purpose here. Distrac- tion was too easy with Uriah nearby. The water in the basin sparkled with the night’s chill, making her shiver again. Tirzah rested the jar on her shoulder, waiting. Bathsheba pulled the comb from her hair, letting the length of it fall to her back, the thick tresses covering her like a cloak. She stepped into the basin and knelt, the frigid water prickling her flesh. She sucked in a quick breath as Tirzah poured the first stream of cool water over her head. She took the hyssop from Tirzah’s outstretched hand and rubbed her arms and legs, then wrapped both arms about her, bracing herself again. Tirzah lifted the water and poured a second stream over Bathsheba’s head until it touched every part of her body. The shock of the cold and drenching water caused her to look up, to gaze heavenward. Her heart con- stricted with this gentle reminder of her need to be pure before Yahweh—something she could not do during her time of uncleanness. She bowed her head, praying her humility would grant her favor in His eyes. Would her night in Uriah’s arms bring about the child they both craved? She closed her eyes as Tirzah poured the water a third time. Shame filled her, her heart as bare before the Lord as her glistening skin. Oh, Adonai, I am in need of You, a sinner at birth, unable to keep Your perfect law. Wash me and I will be clean, whiter than snow. The words, once a memorized tradition she had learned to quote by rote as a girl in her father’s house, had become personal in recent months. A sense of unworthiness filled her, a stark reminder that her uncleanness must be atoned for. shaky hands toward the heavens, tears mingling with the moisture dripping from her hair. Forgive me, Adonai. She knew a sacrifice must be given to know true forgiveness, but her heart longed for it just the same. Perhaps it would be enough to acquire God’s favor this night. She stepped out of the bath and snatched the towel from the bench, drying her skin along with her tears. Slipping her arms through the sleeves of her robe again, she hurried into Uriah’s outstretched arms. 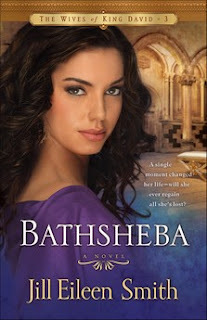 Bathsheba rose from the bed, careful not to awaken Uriah. He shifted at her movement, and she stilled, looking down on his contented form. His chest rose and fell in a slow rhythmic pattern, his breath even and soft. The dark hairs of his neck curled beneath his night tunic and met the edges of his beard. She felt a blush fill her cheeks as she lingered, remembering, longing to keep him with her. But they had only two more nights together before he left again for many months. On the third night he would sleep in another room, refusing any intimate touch in preparation for war. Something she could never understand and could not bring herself to accept. The days spent marching to the place of battle should give him plenty of time to become pure. Why did he have to start before he even left her side? bowl to keep the light from going out. The lamp illumined the room where the servants would soon set the bread to baking and prepare the foods Uriah would take to break his morning fast. He always rose before dawn, ate quickly, then hurried to the tent where the ark stood, in time for the first trumpet’s sound. One more way he showed his devotion to Adonai. Or perhaps he thought somehow his actions would win the Lord’s favor . . .
Banishing the thought, she sat on the end of a long wooden bench and rested her elbows on the smooth table, trying to stifle a yawn to no avail. She never slept well before Uriah left for war, and she couldn’t decide if it was missing him that troubled her most or the fear of losing him to an enemy arrow. She searched her mind, wishing she could stop the fear, but exhaustion kept the worry always on the fringes, clinging when she wished she could release it like chaff blown away with the wind. “Trouble sleeping again?” Tirzah appeared at the threshold of the cooking room, her own lamp in hand, her hair dishev- eled in a tangled mess. She stepped closer and took a seat at Bathsheba’s side. She placed a hand on Bathsheba’s shoulder, patting it softly. Tears pricked Bathsheba’s eyes. Exhaustion made her emo- tional, something Uriah seemed at a loss to handle. So she’d taken to hiding her feelings from him when she could. He was good at drawing them out of her when the mood was right, when he felt especially considerate. “I think you would lie to yourself. To your husband. Me, you would avoid.” She smiled, the lamplight casting strange shapes over her round face. Bathsheba turned away, not liking the direction the conver- sation had taken. “I have nothing to lie about.” She scanned the walls and ceiling of the room, listening to the scratching sound of field mice somewhere in the shadowed corners. Despite their efforts to keep the food high and away and the room swept, the creatures always managed to find some reason to invade the house. She lifted her feet beneath the bench on instinct, shuddering. “I think . . .” Tirzah paused as if weighing whether she should continue. “I think you are lonely, perhaps even angry.” She held Bathsheba’s gaze for a suspended moment. “If I am lonely, it is only because he’s gone more than he’s home, and I have no child to take his place. Any woman would feel the same.” She took another sip from the cup, feeling the warmth of the wine move through her. “You feel unworthy, mistress? Whatever for?” Tirzah moved close to Bathsheba again, the lamp between them. Tirzah gave a disgusted grunt but quickly looked about her as though afraid the walls had ears. “The master is as much to blame as you, mistress. If you count up the months he is gone, they would amount to more than half of every year. How can he give you a son in such conditions? You know this.” She muttered something under her breath. “I would rather not repeat the word I used, mistress.” She looked chagrined, and Bathsheba smiled. “Men are all alike. Bathsheba couldn’t stop a soft laugh. “In this I will agree. But you know men would not begin to take the blame for such a thing.” She set the cup on the table. “Uriah is atten- tive . . . when he is here.” She couldn’t help defending him, despite her irritation. He was a good man, a loyal husband. A bit overbearing where the law was concerned sometimes, but nothing she couldn’t live with. He was honorable to the core, and she respected him for it. Besides, it did no good to complain about war or to wish Uriah worked a trade instead of commanding a company of men always ready to do the king’s bidding. She couldn’t change Uriah or the king or the ever-present need to do battle with Israel’s enemies. What she wouldn’t give for a solid year of peace. But that wasn’t likely to come any time soon if her father and Uriah were to be believed. Bathsheba nodded, comforted by the servant’s ability to take over and make sense of any situation. She watched Tirzah walk away, the fear of loneliness not quite so tangible now. If she could have been completely honest with Tirzah, she would have admitted that it was indeed the loneliness that worried her the most. She didn’t want to end up a widow with no one to love her. Uriah did love her, didn’t he? But his loyalty to her was not undivided. When the king called, he always answered.